72 rolls (i.e. 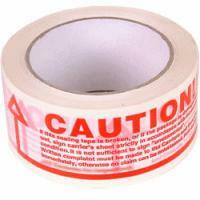 2 boxes of 36 rolls) of LOW NOISE caution printed packing tape 48mm x 66M. These are industrial length rolls, and perfect for making your customers check packages before signing for them. It asks your customers to check the package before signing, and sign for as 'damaged' if there is any damage to the box.